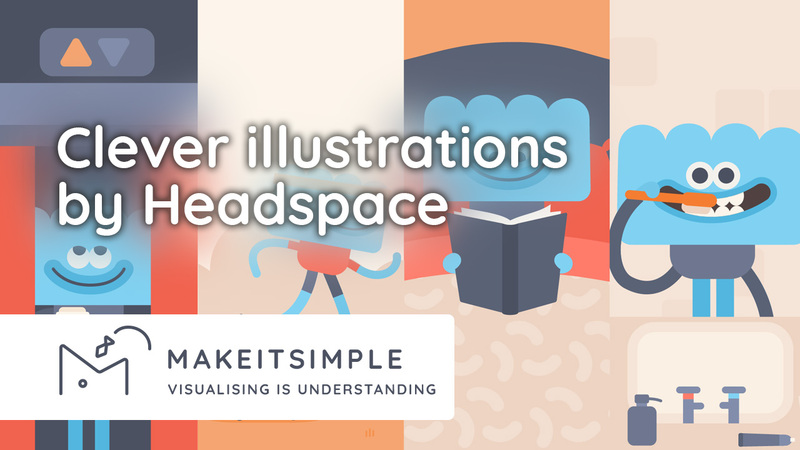 We are big fans of the way Headspace uses illustrations to make their app even more friendly in it’s use. Today’s vlog is all about Headspace. Hey everybody this is Gijs Habraken from Maak het Simpel. As you may have noticed I’m speaking English right now because we are currently changing the company from Maak het Simpel which is Dutch, to makeitsimple.studio and that’s because we think it’s good for our market. Anyway I will be vlogging in English from now on. Today my subject is about Headspace. It’s an app I use it very often personally because it’s just a really nice way to relax and get out of the busy world for a moment. If you start using their app you see a lot of illustrations which guide you through the process of your first meditation. Also every chapter has its own headline and they use animations every once in a while to show you what you should act like and how you can relax better. Even their marketing on for instance; Facebook if you still use that. It’s really wonderful and even their website has the same style of illustrations which are also moving so you already have the feeling you are that Illustrated person on their head page. If you’re thinking ‘hey I want something like this’. Well we can help you out with that. Our studio is called Make it Simple. We’re specialized in visualizing complex information, processes for your app, for your website for your marketing, and we can most certainly help you out. Thank you very much for watching and see you next time. Bye!